Make Camp Interlaken your entire family’s second home by experiencing Camp with your family! At the end of the camp season, bring your family to join us on Lake Finley! Family Camp begins on a Tuesday and lasts for five nights. Family Camp offers a day camp program in the morning for children while the parents get to experience all of Camp Interlaken’s favorite activities like waterskiing or the high ropes challenge course. In the afternoon, parents and their children will experience Camp Interlaken’s activities together! At night, our staff deliver great family evening programs like a carnival, a photo scavenger hunt, a family talent show, a mini maccabiah, and more. After the family evening programs are over, our counselors offer programming for camper-aged participants while younger kids get ready for bed. After 10pm, our staff begin shmira, guard, which resembles a babysitting program so the adults can participate in an adult evening program while enjoying a tasty nosh prepared by our food service staff. 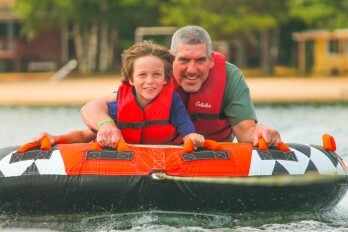 For information about the dates and rates of family camp, please click here. Space is limited; to register for Family Camp, please contact Beth Alling at balling@jccmilwaukee.org.